Home Gaming News Super Mario Bros. In an attempt to break into the North American gaming market, the president of Nintendo, Hiroshi Yamauchi, requested employee Shigeru Miyamoto to helm a new project. Being the first time he ever found himself designing a game, Mr. Miyamoto took cues from various inspirations such as Popeye, Beauty and the Beast, and King Kong. The result was the 1981 arcade hit Donkey Kong, which fulfilled Mr. Yamauchi’s goal when it proved popular in the United States and Canada. As a testament to its success, by June of 1982, it had sold 60,000 cabinets, earning a profit of $180 million. As the arcade scene was enjoying the height of its popularity, the video game market as a whole began to experience periods of rapid growth. Much of this growth could be attributed to the success of the Atari 2600 – the first successful console to utilize interchangeable cartridges. Many third-party developers sought to exploit this rapidly growing industry – Nintendo among them. Suddenly, Donkey Kong saw itself ported and packaged with the ColecoVision – one of the Atari 2600’s top competitors. However, Nintendo did not intend to remain a third-party developer for long. Since 1980, designer Masayuki Uemura had been leading Nintendo’s R&D team with the intent to create a gaming system of their own. Their aim was for their product to be less expensive than its competitors while also performing at a level no one could match in the foreseeable future. In order to keep costs low, the team opted against using keyboards, modems, or floppy disks. If they were to develop any add-ons, a 15-pin expansion port connection could allow the use of peripheral devices. Having found success with his Game & Watch product line, which proposed the novel concept of portability in the medium, Gunpei Yokoi designed the console’s controller. The controls on a Game & Watch console were intended to replace the bulky joysticks found on arcade cabinets. The console, dubbed the Family Computer or Famicom, launched on July 15, 1983. Its launch titles included ports of Donkey Kong, Donkey Kong Junior, and Popeye. The Famicom sold well, but consumers quickly began complaining about the units freezing during gameplay. Upon discovering a faulty circuit, Nintendo recalled all of the consoles, suspending production until the issue was resolved. This cost the company millions of dollars. Despite this setback, they reissued the console with a new motherboard. This allowed the Famicom to outsell its primary competitor at the time: the Sega SG-1000. As 1984 drew to a close, Nintendo had sold over 2.5 million units. In the face of this success there was only one logical thing to do: turn their attention to markets abroad. This proved to be easier said than done. One of the biggest obstacles Nintendo faced was convincing a skeptical public to adopt their system. The reason behind their potential consumers’ lack of faith in the industry stemmed from an event retrospectively dubbed the Video Game Crash of 1983. The Japanese themselves referred to it as the Atari Shock, which was an apt name given that company’s role in the recession. Popular culture attributes the crash to two high-profile disasters – the subpar Atari 2600 port of Pac-Man and the adaptation of E.T. the Extra-Terrestrial, the latter of which became one of the most infamous titles in the medium. However, it’s inaccurate to assume those two games were the sole cause of the crash. If anything, they were symptoms of larger problem the medium as a whole was facing: oversaturation. Because the idea of publishers was a largely foreign concept in gaming at the time, there were few barriers to entry. Coupled with no quick method of determining whether or not a given game adorning store shelves was a quality product, consumers collectively turned their back on consoles. Nintendo attempted to negotiate with Atari to release the Famicom outside of Japan where it would be known as the Nintendo Enhanced Video System. The companies appeared to have reached an agreement, and the contract papers were to be signed at the 1983 Summer Consumer Electronics Show. However, at the last minute, Atari refused to sign. Coleco, one of their primary competitors, demonstrated a prototype of Donkey Kong for their upcoming Coleco Adam computer system. Though a port had appeared on their earlier console, the ColecoVision, Atari had the exclusive distribution rights in the computer market. Atari then perceived this as Nintendo dealing with Coleco behind their backs. The issue was cleared up, but Atari’s financial problems as a result of the crash ensured they could not proceed with the deal. With nobody willing or able to distribute their product in North America, Nintendo had no choice but to proceed alone. Mr. Yamauchi assessed that Atari collapsed because they gave too much freedom to third-party developers, swamping their system with barely functional games. They implemented a lockout chip to prevent unauthorized games from being played in their system. Unfortunately, even after taking these precautions, they had to deal with American retailers believing video games to be a passing fad. 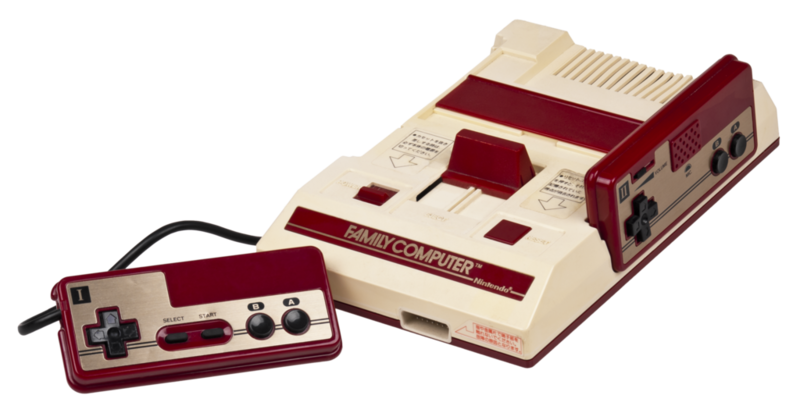 In order to have any chance of selling the Famicom to a foreign market, Nintendo had to downplay their product’s status as a video game console. Therefore, they decided to market it as a home computer called the Nintendo Advanced Video System (AVS). The AVS was to be then outfitted with a keyboard, cassette data recorder, and a cartridge containing a BASIC interpreter. Tying everything together would be a wireless infrared interface. Nintendo showcased the AVS at the Consumer Electronics Show in the winter of 1985. Attendees were vaguely impressed, though they didn’t care for the keyboard or the wireless design. Still wary due to the 1983 crash, retailers didn’t order a single system. Even worse, the American gaming press felt the console could have any success in North America. One of the most damning statements came from the March 1985 issue of Electronic Games magazine wherein a writer felt that “this could be a miscalculation on Nintendo’s part”. That summer, Nintendo returned to the Consumer Electronic Show with a new version of the AVS. They designed the system so it would not resemble a video game console at all, avoiding terms associated with the industry by calling the cartridges “Paks” and the console the “Control Deck”. This new model would also have a front-loading chamber as opposed to the Famicom’s top-loading slot. 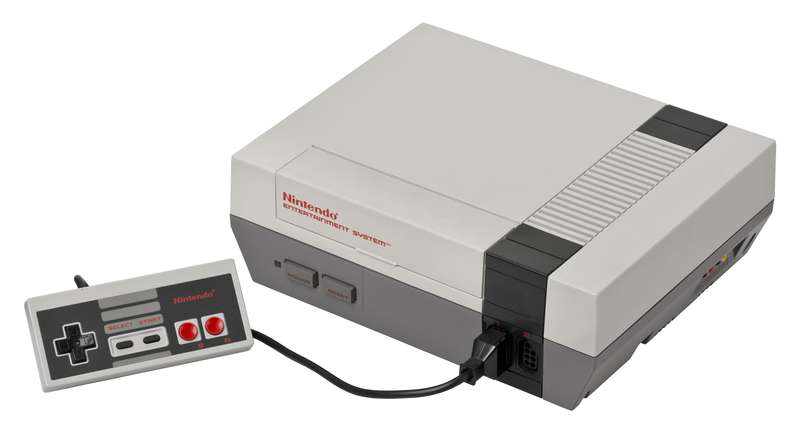 To further disguise its true nature, the console was renamed the Nintendo Entertainment System (NES). Enforcing its status as a toy rather than a console were two peripherals: a toy called R.O.B. (Robotic Operating Buddy) and a light gun. Even after R.O.B. helped generate interest, retailers were still unwilling to distribute the console. From there, Nintendo redoubled their efforts, effecting telemarketing campaigns and demonstrations in shopping malls. Retailers at last relented upon learning they wouldn’t have to pay anything upfront. After ninety days, retailers would either pay or return everything to Nintendo. With the console slated for a launch in October of 1985, they knew they would need to make their launch an impactful one. To this end, they decided to bundle each console with one of their games. Luckily for them, Shigeru Miyamoto was putting the finishing touches on a game perfect for such a monumental task. Its name was Super Mario Bros. Released in 1985 as a North American launch title, Super Mario Bros. quickly became one of the bestselling games in history, eventually moving over 40 million copies. Both the game and the console on which it debuted are credited with reviving the North American industry from the brink of death. As one of the most famous games in existence, could Super Mario Bros. still have a rightful claim as one of the greatest of all time? The story of Super Mario Bros. is simple enough. King Bowser of the Koopa Troopas has invaded the peaceful Mushroom Kingdom. He used his magic to transform the inhabitants into inanimate objects such as mushrooms and bricks, and only the kingdom’s princess, Peach, can reverse the spell. However, she has been kidnapped by the tyrannical king. Upon learning of this, a hero named Mario springs into action, determined to save the kingdom. Shigeru Miyamoto had worked alongside Takashi Tezuka to create two games for their Famicom console: Excitebike and Devil World. In the game’s earliest development phases, the two of them wished to combine the scrolling screens from Excitebike and the large character sprites in Devil World. Their main goal was to have a character traverse many different lands with different themes to them. They began with a placeholder character – a 16 X 32 pixel rectangle. They quickly ran into a problem when they realized the rectangle was incapable of jumping. Observing the popularity of their arcade game, Mario Bros., Mr. Tezuka suggested making Mario the main character in lieu of the rectangle. Mr. Miyamoto agreed, thus Super Mario Bros.
As suggested by its title, Super Mario Bros. is a successor to the classic arcade game Mario Bros. Despite starring the same character in the lead role, the gameplay is quite different. It shares the two-dimensional perspective of Mario Bros., but that is where the similarities end. Countless arcade games focused all of its action on a single screen. While select titles such as Ms. Pac Man and Nintendo’s own Donkey Kong featured multiple stages, their entirety was in plain sight. 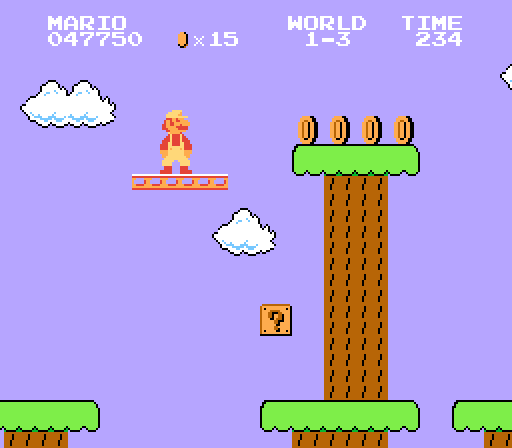 By contrast, moving Mario to the center of the screen in Super Mario Bros. will cause the game to scroll with him. This momentum will come to an abrupt when Mario collides with the first enemy, a slow-moving, mushroom-like creature called a Goomba. The mistake will cost the player one of their three lives. What I described is likely the first experience countless people had playing this game in 1985. 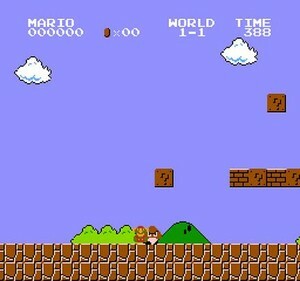 Super Mario Bros. was the first exposure countless people had with the medium in the home setting. The Atari 2600 was the most successful console before the NES, and the games that featured on them were easy to figure out. A major reason for this concerned its controller. With a joystick controlling movement and a button whose function became obvious after a few seconds of experimentation, games on the Atari 2600 were equal parts intuitive and simple. Rival consoles such as the Intellivision and the ColecoVision had more advanced controllers that resembled a touch tone phone layout, but the Atari 2600’s popularity ensured its model was the more well-known. When consumers were handed an NES controller, they realized they needed time to adjust. While the apparatus had two buttons labelled “SELECT” and “START”, which served perfectly intuitive functions, the remaining features were less self-explanatory. Those who had seen or owned a Game & Watch console knew what a directional pad was, but only a single letter accompanied the remaining two buttons: “B” and “A”. In the arcades, the action each button preformed was literally spelled out for them. I can imagine even after reading the instruction manual, new players had to consciously remember that holding down the “B” button allows Mario to run while pressing the “A” button causes him to jump. It should be noted that these types of games existed before 1985. For example, Namco broke new ground in 1984 with Pac-Land, wherein they casted their most famous character in a game with scrolling level designs. However, because the North American gaming industry was suffering the full effects of its 1983 crash, Super Mario Bros. would be the first exposure many enthusiasts had to this genre. As such, the control scheme of this game would become the standard for the genre. By contrast, Pac-Land, which did not feature a joystick at all, instead requiring players to press buttons for movement, was rendered obsolete immediately. Whether fans called them side-scrollers or platformers, Super Mario Bros. was ground zero for the genre in their eyes. 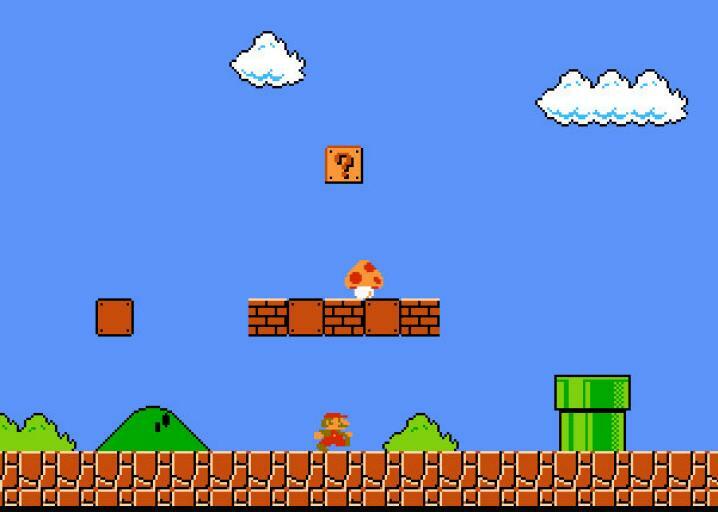 When it comes to assessing Super Mario Bros., it helps to analyze the very first stage. In this era, tutorials explaining a game’s mechanics were exceedingly rare. In most cases, it stood to reason; after all, one could understand how Space Invaders was played in a matter of seconds. However, this also extended to titles with more complex rules such as Ultima or Wizardry. In such cases, a would-be player was expected to read and study the enclosed manual to learn how they worked. With Super Mario Bros., Mr. Miyamoto opted for a different approach. Rather than throwing random obstacles at the player, he wanted them to interact with the array of hazards and objects while traversing the stage. Accordingly, the first stage is designed in a way so that it slowly introduces the game’s relevant mechanics. This includes the concept of gaining momentum while running, making precise jumps, and dealing with the various enemies Mario will face on his journey. 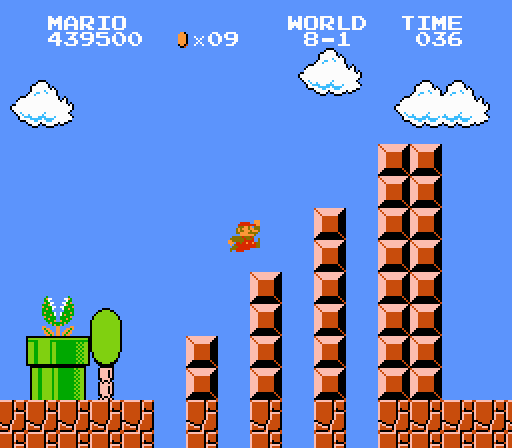 To wit, twice in the first stage is Mario is made to climb two small staircases and jump over the gap to reach the other side. There is no penalty for failing this task the first time around, as there is solid ground underneath. Only in the second instance, in which a bottomless pit is in the center will the player suffer a consequence for a missed jump. Scattered throughout the stage are the two most common enemies in the game: Goombas and Koopa Troopas. By placing a single Goomba near the beginning of the stage, players learn the importance and method of dodging enemies after the incredible likelihood of dying to it on their first attempt. This also gave players a chance to experiment with the game. 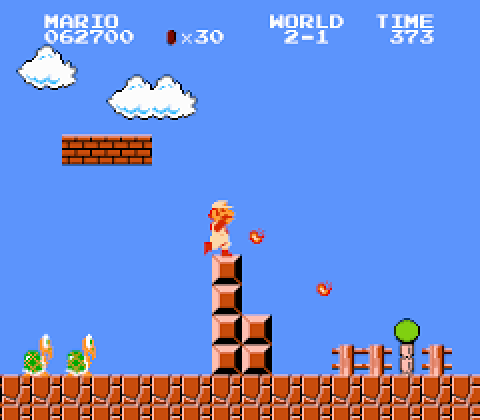 In doing so, an astute player would learn Goombas are easily dispatched by having Mario jump on their heads. Meanwhile, the Koopa Troopas make their debut roughly halfway through the stage. They stand out from Goombas in that they can withstand more than one attack from Mario’s onslaught. By stomping on them once, they retreat into their shells. Running into their shells in this state causes Mario to kick them whereupon they sail forward at a lightning fast speed until they either fall off the edge of the platform or collide with a wall. Originally, Koopas Troopas were to be the standard enemy Mario faced, as they form backbone of Bowser’s forces. However, defeating them entails a two-step process. Staying true to their objective of gradually introducing elements into the game, it was only natural that the first enemy would be a Goomba, which is easily felled in a single blow. Despite their importance to this new design philosophy, Goombas were conceived fairly late in the development cycle. By the time they were programmed into the game, the team only had a scant few bytes left to work with. This last-minute addition works out for the best, as players will learn of Mario’s primary means of defense through dealing with these enemies. By 1985, many enthusiasts had become accustomed to the idea that video game protagonists couldn’t take a hit without dying. Role-playing games provided meaningful exception to the rule, but in action titles, one strike was enough to put them out of commission. Unless one saw a bar with the word “HEALTH” or any other similar term nearby, they could safely assume they were to avoid taking damage at all costs. With no such feature present in the interface for Super Mario Bros., one might assume Mario would be a fragile protagonist. Though a reckless encounter with the first Goomba may suggest that is the case, the truth is a bit more complicated. For those skilled enough to overcome this fearsome foe, they may notice that above it are four glowing blocks each decorated with a question mark. Three of them contain coins, and if Mario obtains one-hundred of them, he gains an extra life. The fourth question mark block contains a mushroom. Upon consuming it, Mario doubles in size, transforming into Super Mario. This is the mechanic that defines the game. Though Mario is a bigger target for his enemies, he can take a hit without dying. In such an event, he will be reduced to his normal size and be granted invulnerability for a few seconds. 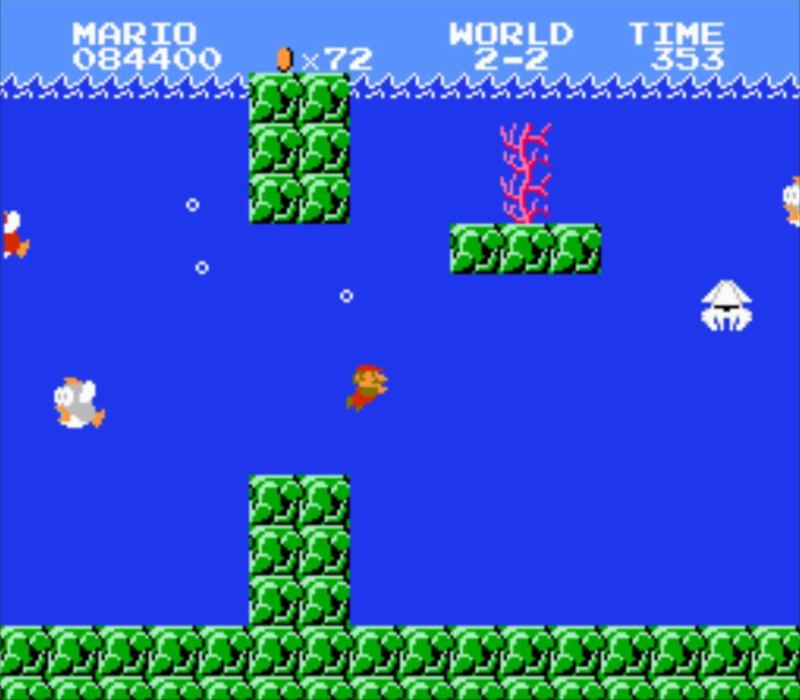 To show players that these mushrooms are beneficial despite looking somewhat similar to the harmful Goombas, the developers made the first one difficult to avoid once released. In this state, he can duck, which is accomplished by holding down on the directional pad, and break bricks by hitting them from below. 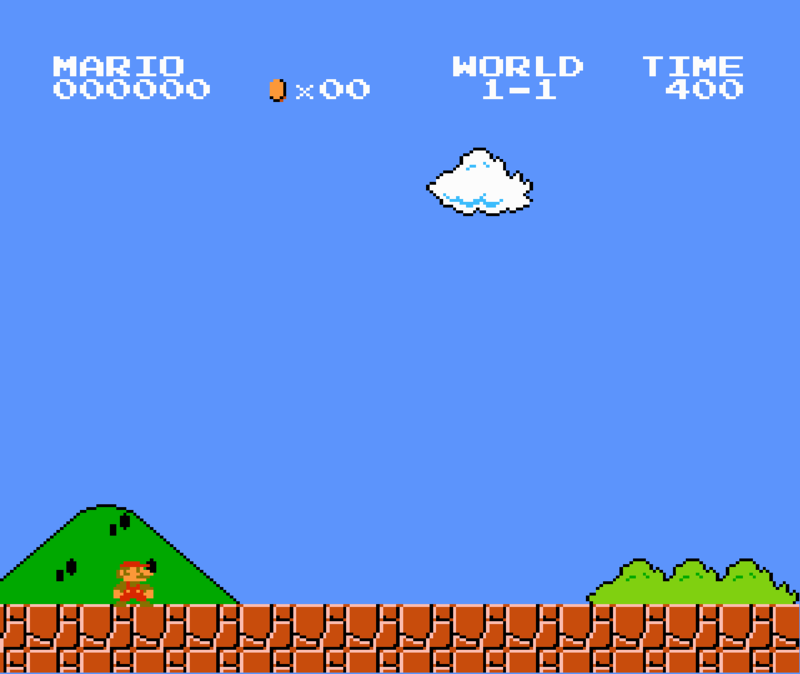 If Super Mario hits a question mark block that would have contained a mushroom, he will uncover a flower instead. Unlike, the mushroom, this flower remains rooted to the spot until Mario collects it. If he reaches it, he will transform into Fire Mario. This form grants Mario the ability to shoot fireballs by pressing the “B” button. Fireballs are capable of defeating most enemies. The first thing new players would appreciate about them is their ability to defeat Koopa Troopas outright without having to stomp on them twice. Despite requiring two power-ups to obtain, Fire Mario reverts to his normal form when struck. If you’re particularly lucky, you will find a flashing Super Star. This wondrous power-up makes Mario invincible for a short duration. Any enemy Mario collides with in this state is defeated automatically. When he collects one, a distinct theme begins playing. You’ll know the invincibly is about to expire when the default music begins playing once more. As a measure of geniality, the invincibility lasts a few seconds after the theme stops, letting players know when they cannot rely on it any longer. Though the level design is linear to the extent that backtracking is made impossible, the game grants players leeway when it comes to exploration. In the first stage, you may notice giant green pipes adorning the stage. He must beware of hostile flora known as Piranha Plants that often dwell in them. Housing these enemies isn’t their only purpose, though; by pressing down on the control pad when on top of a pipe, Mario can potentially travel through them. A majority of these pipes lead to an underground area that features an abundance of coins. Whether or not a pipe leads anywhere or only exists as a platform can only be determined through trial-and-error, though this aspect is not randomized. The utility of these bonus areas isn’t limited to merely supplying Mario with coins; when emerging from them, you will often find that you have skipped a majority of the stage. The only downside from doing this is that one misses out on the power-ups dwelling in the stage. It’s easy to get a mushroom before entering the first bonus area, yet Fire Flowers are only reasonably obtainable if one foregoes the shortcut. Moreover, a lucky or persistent player may find that jumping in the right place reveals hidden blocks. The first such one contains a green mushroom that grants an extra life, or 1-Up, when Mario collects it. This scenario and various permutations thereof are prevalent throughout the entire game. Is it better to take that shortcut and protect Mario from harm? Would it be a more prudent long-term strategy to tough out the various hazards in an attempt to collect Fire Flowers and 1-Up Mushrooms? Are you being driven by an urge to top your own personal record? This is what allowed Super Mario Bros. to stand out from its rivals. One would be hard-pressed to find another simplistic game that forced players to think carefully about their next course of action in 1985. Your desire to travel off the beaten path just might see Mario at the very top of the screen where the interface is located. In a normal game, this is an indication that you shattered the code’s integrity. Not so in Super Mario Bros.; it’s plain Mr. Miyamoto and his team knew what they were doing. 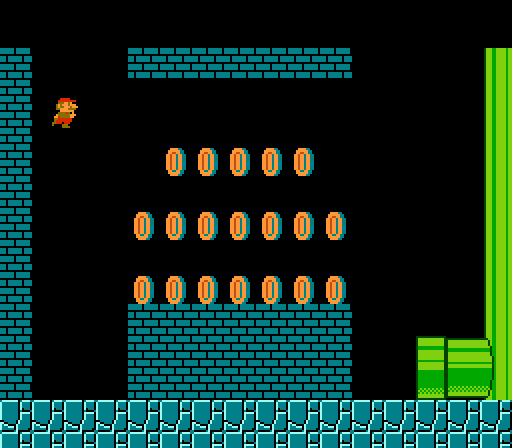 If you guide Mario to these hidden passageways and have him walk past the normal exit of the second stage, you will be rewarded with one of the game’s many Warp Zones. By going down one of the three pipes, Mario will be placed in the first level of whichever world corresponds to it. This too presents an interesting conundrum for players. 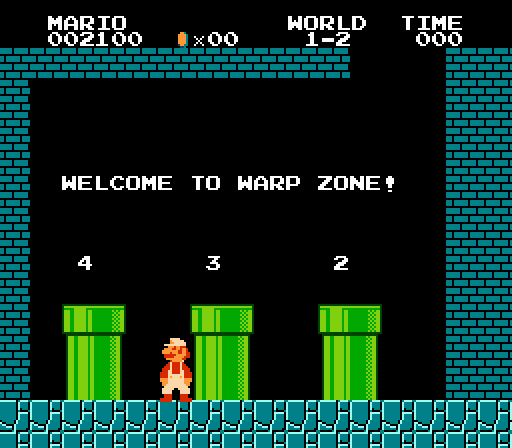 One can use the Warp Zones in order to blaze through the game in as few as eight stages. Then again, this hypothetical player would be missing out on three-fourths of the game by doing that. Could they really claim to have won if they refrained from seeing what it had to offer? The warp zones may seem like a generous service, but Mr. Miyamoto and his team may very well have codified the concept of replay value when implementing them. More than anything, the greatest advantage Super Mario Bros. had over its competition in 1985 was the sheer amount of variety in its level design. In a contemporary effort, the first stage set a precedent for what the player was to expect for the duration of the experience. 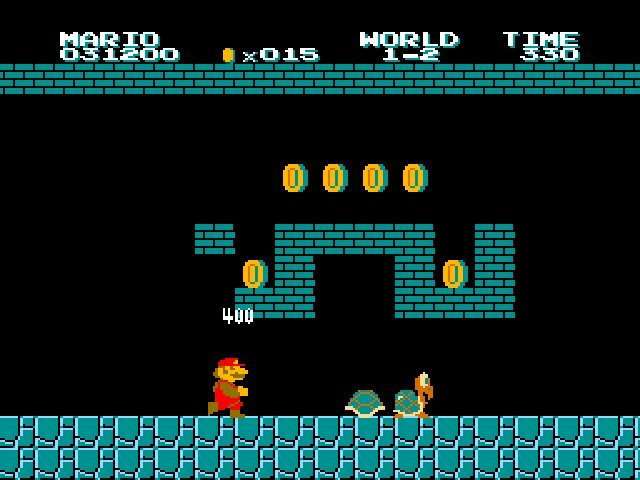 Super Mario Bros. throws the rules established by the first stage out the window in the second by making players traverse an underground cavern. With a bottomless pit dominating a majority of the third stage, players are introduced to the concept of an athletic stage. Though they have no shortage of enemies, the stage design itself is often the greater obstacle players must overcome. By giving players comparatively simpler platforming challenges in the preceding two stages, they are then made to use what they learned and push their skills to their limits. Greeting them at the end of the third stage is a foreboding castle. The music and dark color scheme conveyed to enthusiasts that they needed to approach this stage with caution. This is only reinforced when they must dodge rotating bars made of fire. Any player who read the manual might have been taken aback when they saw fireballs emanating from an unknown source. They knew they would have to fight against a villain named Bowser, yet the idea of facing off against him before leaving the first world was inconceivable even back then. Any remaining doubts would be put to rest when they see the King of Koopas for themselves. There are two ways to deal with this seemingly insurmountable threat. 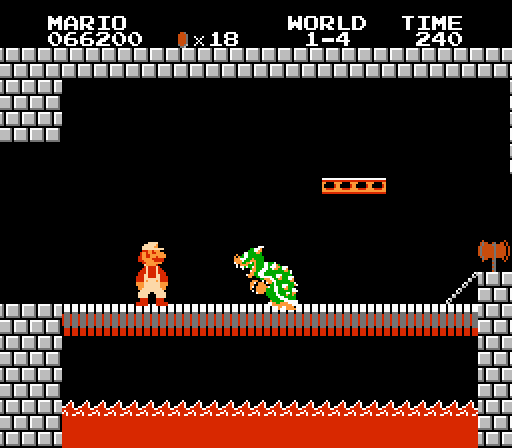 By touching the flashing axe on the right side of the screen, Mario cuts the bridge down, causing Bowser to plunge into the lava below. Alternatively, a player skilled enough to retain Fire Mario throughout the stage can defeat Bowser by chucking fireballs at him. If Bowser is to be defeated this way, an observant player may notice something unusual. As soon as the coup de grâce is delivered, an ordinary Goomba falls into the lava. It’s easy to dismiss this oddity as a glitch, but when Mario reaches the next room, you’ll learn this too was intentional. 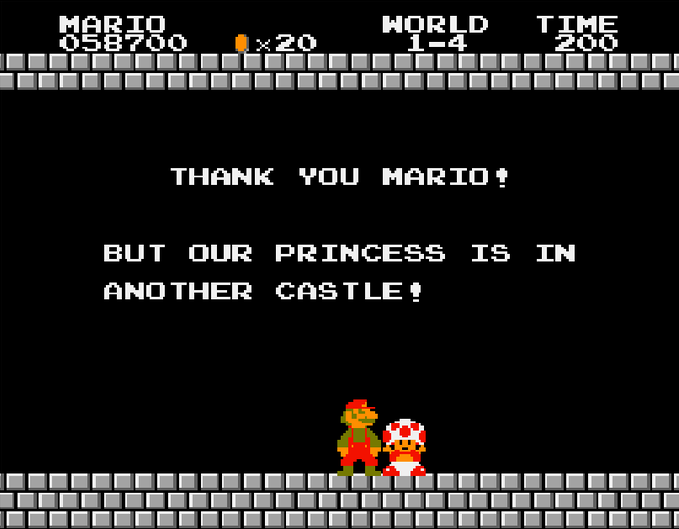 One of the princess’s retainers is there to greet Mario. Though grateful for being rescued, he informs Mario that Peach is in another castle. Though it’s easy to take this twist for granted these days, even the savviest enthusiasts at the time could have been fooled into thinking the first four stages constituted the entire experience. Even observing the stages’ nomenclature wouldn’t necessarily clue them into how many awaited them. Most games this simplistic had ten stages or fewer that would repeat themselves endlessly once the player cleared them all. That Super Mario Bros. could boast thirty-two unique stages never even crossed their minds. It is in the second world that underwater stages make their debut. Mario doesn’t have to worry about drowning in these stages. Instead, he must simply find his way to the end as usual. Underwater stages present an interesting challenge in that they vastly improve Mario’s movement capabilities, allowing him to explore every nook and cranny with little challenge. As a tradeoff, his means of defending himself are far more limited. Without the aid of gravity, he cannot stomp on any of the hostile marine life – Cheep Cheeps and Bloopers. Touching an enemy in any way in these stages will damage Mario. Ironically, not to mention counterintuitively, Mario’s sole means of defense when underwater would be fireballs. Though many great things can be said about Super Mario Bros., there are a few ways in which it falls short in the grand scheme of things. To begin with, being unable to backtrack makes exploring these stages rather frustrating. On some level, I can understand this because making players choose which route they’re going to take forces them to strategize. Much of the challenge of the game would be eliminated if a player could drain a given stage of its resources. Even with the timer bearing down on them, such a feat would be easy to pull off. This justification falls apart in any stage that places Mario in a maze. These stages repeat endlessly until Mario takes a certain path. While not difficult to figure out, it does lead to a few instances in which it’s possible to scroll the correct path off the screen, forcing you to waste time returning to the beginning of the maze. Another problem is that the controls lack polish. To be fair, this is a flaw that wouldn’t become obvious except in hindsight, and in 1985, they were implemented about as well as they could have been for its time. It was very forward-looking for Mr. Miyamoto and his team to have thought about characters being able to build momentum at all. Before then, characters usually had two speeds: moving and non-moving. Even so, it makes revisiting Super Mario Bros. something of a tricky proposition. Don’t be surprised if you end up dying frequently in your attempts to adjust to the game’s physics engine. This is especially noticeable whenever you’re made to jump on platforms that are only one block wide. Despite all of these problems, I would say the Achilles’ heel of Super Mario Bros. is that the level design doesn’t have much personality to it. Super Mario Bros. is a game in which Mario finds himself squaring off against walking mushrooms, giant turtle-like creatures capable of throwing hammers, flying squids, and a monster that chucks spiked enemies from a cloud. It’s difficult to appreciate the colorful rogues’ gallery when the worlds themselves often lack a unifying theme. While some are set at night and others after a heavy snowfall, these changes never impact the gameplay in any substantial way. This would be easy to forgive if the design itself was consistently inventive and always challenging its players in new, creative ways. Unfortunately, the indistinct level design masks a bigger problem. Namely, a lot of later stages have an identical design to earlier ones. This can be seen as early as World 5-3, which is a carbon copy of World 1-3. In fact, it’s to the point where the seventh world only has one original stage. The designers do introduce tougher enemies to balance this out, but I feel it doesn’t work in practice. Nonetheless, it’s admirable that a majority of the stages have unique designs, and the developers reusing any of them was more indicative of the growing pains associated with leaving behind arcade sensibilities than laziness or apathy. 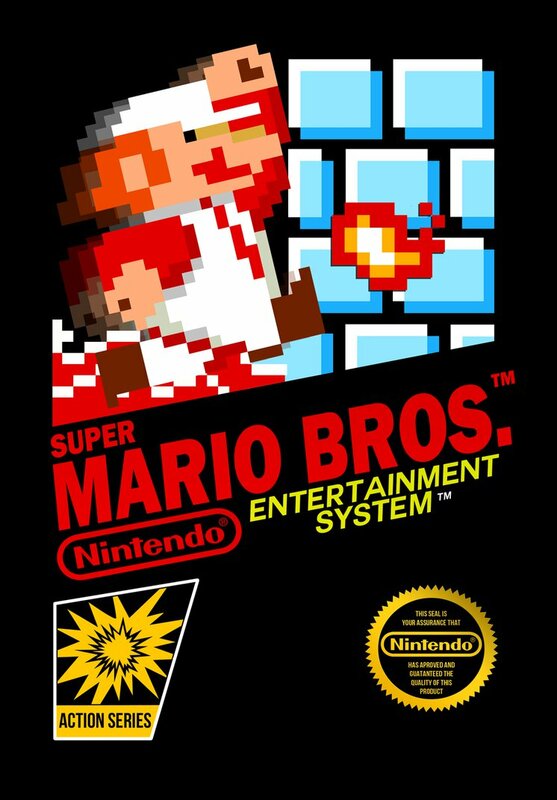 It is nearly impossible to overstate what a technical achievement Super Mario Bros. was when upon its 1985 release. No other console game could claim to have offered the sheer amount of content Super Mario Bros. boasts. One could say the PC gaming scene had been regularly churning out titles that were more advanced from a technical standpoint. However, these types of games required a certain amount of expertise and dedication just to run let alone complete. Super Mario Bros., on the other hand, actively welcomed a new wave of enthusiasts with open arms. Early role-playing games such as Ultima and Wizardry deserve their place in history for demonstrating the medium’s latent potential, but the success of Super Mario Bros. ensured it reached a mass audience. When playing this game, you’ll find it hard to believe that the developers worked without a creation tool. Instead, Mr. Miyamoto and Mr. Tezuka would draw the levels on graph paper, allowing a secondary team led by Toshihiko Nakago to program them into the game. If there were any residual effects from programming the game in such a fashion, they certainly don’t show in the final product. After having said everything there is to say about Super Mario Bros., the real question is whether or not it could still be considered among the best games ever made. I have little doubt it had a claim to such a pedigree back in 1985, but these days, I’m not so certain. This is primarily because Super Mario Bros. ultimately became what every innovative title should be in the long run: the standard. Countless artists followed this game’s lead, providing their own take on the platforming genre while improving upon it in their own unique ways. Consequently, it can be difficult to appreciate Super Mario Bros. from a modern standpoint. One would be forgiven for believing that it comes across less as finished game and more the result of following a style guide without adding any personal touches. Still, someone had to write that style guide and considering Super Mario Bros. was made in a time when most programmers couldn’t possibly have grown up with the medium, it’s actually incredible it holds up as well as it does. Very few creators at the time put themselves in their audiences’ shoes when developing games, and Super Mario Bros. is a better effort than its contemporaries for it. Though I wouldn’t declare it an essential play, attempting to discover this game for yourself isn’t a bad idea at all.